Meet the 2018 Ford Escape. This small SUV is a perfect choice for drivers who want a versatile vehicle for around town or long distance driving. The new Ford Escape is loaded with convenience, comfort and safety features. It is offered in several trim levels: S, SE Titanium and a new SEL level. New Ford Edge drivers will enjoy plenty of power under the hood courtesy of Ford’s selection of efficient engine types. Ford Escape S models are powered by a 2.5L I-4 engine. Escape SE and SEL models are powered by a 1.5L EcoBoost engine with Auto Start-Stop Technology and Escape Titanium models draw power from a 2.0-liter EcoBoost® engine. All models are equipped with front wheel drive, four-wheel independent suspension and a six-speed SelectShift® automatic transmission. The Ford Escape interior is filled with convenient storage compartments and offers plenty of head, leg and shoulder room for driver and passengers alike. The handy 60/40 split fold-flat rear bench seat allows for a variety of cargo configurations to accommodate wide or tall objects. Leather trimmed heated front seats are standard on SE, SEL and Titanium models and all models are equipped with Ford’s SYNC technology. Advanced safety features on the new Ford Escape include AdvanceTrac® with Roll Stability Control™, four-wheel disc with anti-lock brakes, rear view camera and multiple air bag placement including driver’s knee, front-seat side, and Safety Canopy® System with side-curtain airbags. 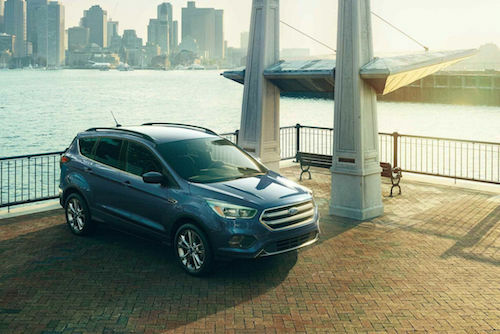 Our Ford Dealership near San Francisco has a wide selection of new Ford Escape models to choose from. We invite you to learn more about this innovative and affordable SUV by taking a test drive soon.